One of my favorite aspects of rabbi-ing in the Lehigh Valley has been the absence of the Gotcha! game. You know the one I mean – where people watch the rabbi for a mis-step in the hope that they will catch him in an error, or, even better, in some personal shortcoming. The resulting lashon hara, even if it never progresses to an actual firing, turns off rabbis (sitting as well as candidates), turns off other congregants, turns off potential congregants, and generally damages the community in broad and irreparable ways. Thank Gd and thank the good people of my community, we don’t have that nonsense here (for the most part, anyway; there's always one or two), and I appreciate it. I think it’s helped me do a better job; people function at a higher level, especially in a position as personal as the rabbinate, when they don’t need to constantly look over their shoulders. The Gotcha! game is the main reason I refused to contemplate the pulpit even as I was studying for semichah (ordination). As a teen I saw a significant number of communities where the game was played, where rabbis were treated harshly on the basis of events that did not reflect the majority of their work, or even as a result of simple mistakes. Shuls would eat their rabbis. Example: I know a shul in which a group lobbied for the rabbi’s dismissal because he burped while teaching an evening class. We’re not talking about an egregious belch, or a pattern of dyspeptic behavior, or a burp followed by a satisfied, “Ahhhh!” – one discreet burp, in one class, and five instant enemies. Really. • They feel compelled to fulfill the biblical mitzvah of rebuke (cf Bava Metzia 31a on the mitzvah of rebuking your rabbi). • They hold the rabbi to a higher standard because he is supposed to serve as a role model. • Sometimes it’s because people take their Judaism and their shul personally, and can’t stand to see anything that isn’t quite right. • And sometimes it's because rabbis taste good, especially with ketchup. But at other times it really just seems to be meanness. • Someone once told me that he thinks the Gotcha! game comes from people who can take out their own work frustrations on their employee, the rabbi. It’s like people who abuse their hired help at home. • Another rabbi once told me he thought it was latent aggression toward authority figures, perhaps even their parents. • Others suggest it’s because the rabbi is up there telling people right and wrong, and so it’s easier for people to pick on him for his flaws than to listen to his words. Thank Gd, it hasn’t been a significant factor for me; I hope many other rabbis can say the same. Ruth the Moabite had been ruined by her association with Jews; she had married a wealthy young man, and then he had died, along with his brother and his father. The family’s wealth had disappeared. Now her mother-in-law Naami was preparing to abandon her and return to a place where Moabites were persona non grata - and Ruth insisted on accompanying her to that hostile land, without a penny to their names. Naami was astounded; what could this young girl want with her, and her people? What practical gain could be in store for an impoverished, friendless Moabite in a Jewish land? The megilah doesn’t tell us what inspired Ruth, only that she was idealistically certain that this was the nation and the Gd to which she would commit her life. באשר תלכי אלך – Where you will go, I will go. Contrast Ruth’s idealism with the survivalist pragmatism of a man named Barak, a Jewish general of some 3200 years ago. In Barak’s day, the Jews lived under oppression by the Canaanites. They cried out to Gd, and their prophetess, Devorah, commanded Barak in the name of HaShem to lead a rebellion against the Canaanites. She even gave him a military strategy, instructing him which tribes to take with him, and where to engage in battle. • We override Rabbinic law regularly for שעת הדחק, cases of need. • Our vision of mashiach is of an עני ורוכב על החמור, a pauper riding a donkey, anointed for his piety rather than for the pragmatic values of wealth or social status. To borrow a passage from Man of La Mancha, “Maddest of all [is] to see life as it is, and not as it should be. ” This emphasis on idealism, on seeing the world as it should be, is a most Jewish concept; Judaism nods to the pragmatic, but it reveres the idealistic. We have just completed a seven-week journey from Egyptian slavery to Divine revelation at Sinai, a trek during which an entire nation was challenged to metamorphose from Barak-style pragmatists to Ruth-style idealists. A slave cannot afford ideology; he is too busy trying to satisfy his master and avoid harm. Through the desert trip that slavish pragmatism was quite visible, too; the constant attention to food and water reflected a mind that could not see past its most immediate needs. But, eventually, this nation stood at Sinai and established that same נעשה ונשמע attitude which would become Ruth’s mantra. On Shavuos we read Ruth’s story for many reasons, but surely one is her willingness to embrace a Torah about which she knew little, her personal נעשה ונשמע. Certainly, a Ruth-based yearning for the ideal can set the Jew at odds with the world in which he lives and with which he must make some peace; for an example, look no further than the news of the past two weeks, regarding the international stances on the future of Yerushalayim. The United States, led by a different Barack, is opting for a pragmatic, survivalist stance; ditto for Europe, as expressed last week by France. They look at Yerushalayim on a practical level: The Arab world will never be satisfied with a Middle East that does not incorporate a state of Palestine, with its capital in Yerushalayim. The wrath of that Arab world, seen from a pragmatist’s perspective, is a lot more dangerous than the outrage of the Jewish world – so guess who wins? But we know how a Devorah would reply: Yerushalayim is not a random hilltop, it is the ideal of ideals within Judaism! The walls of Yerushalayim encircle critical elements of Jewish history; just two weeks ago they found yet another shard with an inscription dating back to the period of the first Beit haMikdash, apparently marked with the name of a king mentioned in Tanach. Those walls also encircle the essence of Jewish unity, a city owned not by any one tribe but by the nation as a whole. To this city, Jews would flock for aliyah laregel every Yom Tov. To this city, Jews would bring their maaser sheni tithe, beautifying the markets with their produce. And to this city, Jews would come every Shavuot with their Bikkurim/first fruits and give them to the kohanim. And those walls also encircle the essence of Jewish spirituality, the Beit haMikdash and its associated triple-corded bond between individual and nation and HaShem. It is not for nothing that the sages speak of a Yerushalayim shel Maalah, a heavenly Yerushalayim parallel to Yerushalayim here on earth, a city above in which HaShem can be found when we gather in the city below. For the Jew, descendant of the idealistic Ruth, Yerushalayim is the indispensable ideal, and this sets him at odds with the world’s survivalists, whether the military Barak of Tanach or the presidential Barack of today. To be a descendant of idealistic Ruth often means to be at odds with the world’s pragmatic Baraks, and we must find a way to mediate between those poles. Today we celebrate Shavuot, and we also mark the engagement of __________ and _________. Building a Jewish home requires a blending of the real and the ideal, but the ideal must always reign supreme. In the beginning it’s all ideal; the thoughts of how married life will look are untempered by real experience, the conversations are about ideas more than they are about reality. Certainly, an engaged couple deals with the specific facts of the wedding, of where to live, of what sort of home to have, but it’s without the nuts and bolts that make up daily life, the price of yogurt, the questions of who will prepare dinner, mow the lawn and take out the trash, the specifics of paying bills on time. Then, once a couple becomes responsible for a home, for each other, for shared life, that’s when reality kicks in and ideology can be a struggle. To build a strong Jewish home requires both Ruth and Barak, but more Ruth than Barak. Yes, the Jewish family must make concessions to reality, but the ideological commitment of building a Jewish home, of having active Torah study at every meal, of having Shabbat guests and a tzedakah box and sefarim, must remain primary. Common sense dictates that marketing is no substitute for substance, but that doesn’t stop people, including rabbis and synagogues, from investing far too much of their time and energy into advertising instead of into תוכן (content). Example: Fledgling rabbis often give their shiurim provocative or mystifying titles, as a way of drawing an audience. The problem is that if the class isn’t as fascinating as the title, the result is (1) a dissatisfied audience, and (2) an audience that won’t trust your titles in the future. I learned that lesson early on. In my second year in the rabbinate, I gave a talk before Rosh HaShanah on the 13 attributes of Divine mercy. I wanted a title that would be more engaging than “13 attributes of mercy,” so I billed it as “Diamonds and Water Polo.” The talk did have something to do with each of those (viewing the 13 as 13 facets of a single diamond, or as individual members of a team, a la 13 players on a water polo team, oriented toward the same goal), but it really was not all that relevant, and I recall one couple who were turned off by it. I was reminded of this when a friend showed me satiric tefillot for Shavuos night; among the practices they pick on is that of the hyper-dramatic and misleading title. “It should be your will, the Lord my God, that no mishap should occur because of me, and I should not err in a halakhic matter and my colleagues will rejoice over me, and I should not declare the impure pure or the pure impure, and my colleagues should not err in a halakhic matter and I will rejoice over them." What does he say when he leaves? "I am thankful to You, the Lord my God, that You have placed my lot among those who dwell in the beit midrash and not with those who hang around street corners. They arise early, and I arise early. I arise early for words of Torah, and they arise early for idle matters. I toil, and they toil. I toil and receive reward, and they toil and do not receive reward. I run, and they run. I run to the life of the world to come, and they run to the pit of destruction. May it be Your will that no mishap should occur because of the gabbaim, that the drinks should be hot and the borekas should be excellent all night, and save me from poor and unidentifiable borekas lest I err and declare the cheese potato and the potato cheese, and lest I stumble and be seduced to attend a shiur with a provocative, promising title like, “Was Goliath a dwarf?” only to reveal that Goliath was actually a giant. And save me from shiurim which often come into this world, the titles of which end with the word, “Really?” as in, “Yosef the Tzaddik: Really?” the contents of which are not like their exterior, which, counter to their title, are actually frighteningly dull. And lest I accidentally enter a shiur with an explosive title like, “The historiography of the book of Kings II in the light of deterministic research,” taught by a rabbi who is also a professor or a professor who is also a rabbi, the content of which is like their exterior, and not only is their title incomprehensible, but so is their content. And may I merit to enter shiurim in which one can sleep from the first sentence to the last, such as, “The laws of borer on Shabbat,” or, “The view of the Ritva in the discussion of Pesach which occurs on Shabbat.” And make available to me a tall person who will sit before me and hide me while I sleep, and I will rejoice over him, and arrange a shorter person behind me, and he will rejoice over me. I am thankful to You, that You have have placed my lot among those who dwell in the back of the beit midrash, and not with those who sit in the first row, for I sleep and they sleep, I sleep for half of the shiur, including snoring, and they sleep for half a second and immediately nod to the speaker as though they are listening. I eat and they eat; I eat whenever I am able to escape to the dining room, and they eat the remnants that I leave for them. I am bored and they are bored; I am bored and read the advertisements in the Shabbat bulletins, and they are bored and they are bewildered by the boring source sheet before them. And save me today and every day from a bad chazan who sings melodies at 4 AM, and from a bad friend who pokes my shoulders whenever I sleep, and from an abnormal prayer in the Carlebach style. And return me home in peace, speedily in our days, and make my wife’s cheesecake sweet in my mouth, Amen. I am forever telling people that Billy Joel's Allentown, which described 1970's economic depression and lost jobs, was not about Allentown at all. It's about the collapse of Bethlehem Steel in the next town over, but nothing rhymes with Bethlehem, so Allentown got the song. There isn't really anything more to say. I'll just note that a couple of years ago I announced a fundraising drive for the needs of the Gaza refugees, and was challenged by some regarding their status as refugees. They argued that the residents of Gaza could have left willingly and accepted a re-settlement package. I have no stomach for that sort of posturing; a human being who has been evicted from his home for political reasons is a refugee, regardless of the compensation offered. There is no such thing as appropriate compensation for being kicked out of one's home. The rule applies to the rest of the world, and it should apply to Jews as well. They all had no problem telling us Bernie Madoff (ושם רשעים ירקב) was Jewish – but when it comes to the good guys, Jewish identity is suddenly unmentionable. No mention of his religion, whatsoever. (CNN) -- Sidney Frank made millions marketing Jagermeister and other alcohol brands. Three years after his death, he's a big hit with students at the Ivy League college he briefly attended. He's a big hit not because of what he sold, but because he's given dozens of them what he couldn't afford as a young man: an education at Rhode Island's Brown University. On Sunday, 49 students from low-income families became the first Sidney E. Frank Scholars to graduate from Brown, owing virtually nothing except gratitude to the late liquor magnate. "The world of difference that he made for each and every one of us is unbelievable, incredible," one of the Frank Scholars, 22-year-old Shane Reil, said Sunday. Frank - who left Brown after one year in the late 1930s because he couldn't afford to stay -- gave the school a $100 million endowment in 2004. He stipulated that the fund's income go exclusively to covering all tuition and expenses for the neediest of Brown's admitted applicants. The gift was the largest single one ever given to Brown and one of the largest ever given for undergraduate scholarships in the United States, according to the school. Granted I’m not proud of a Jew making money off of marketing alcohol, but if people can make a point of that thief Madoff's heritage, they ought to do the same for a man of Sidney Frank's benevolence. Today, the 2nd of Sivan, is a special day on the calendar: Yom haMeyuchas יום המיוחס. "Yichus יחוס" is colloquially used in reference to aristocratic lineage, so that the name “Yom haMeyuchas” ends up with bizarre translations. I have seen renderings like Day of the Noble, for example, from people who ought to know better. But yichus actually means “association” or “relationship.” (Hence the word יחסית - relatively.) Someone with "good yichus" is someone who has good associates/relations. And a day that is "meyuchas" is a day with special associates. Indeed, this day has nothing inherently special. Although some do identify possible value for this day itself based on the run-up to Sinai and its status in the Omer, at bottom the 2nd of Sivan is simply the day after Rosh Chodesh and the day before the 3 days of preparation for the presentation of the Torah, and that association is what confers upon it special status. This explanation is consistent with the gemara (Taanit 17b-18b) which talks about special days we don’t fast or don’t eulogize, just because those days precede or follow key days on the Jewish calendar. These days themselves don’t have any celebratory characteristics, but the status of their neighbors spills over to them. Part of me feels like this concept of Reflected Glory is a bad thing, especially when it feels like the whole world has gone Yom haMeyuchas. We clamor for autographs from benchwarming ballplayers, we drop the names of former classmates who have gone on to greatness, we talk about great-uncles and third-cousins who have just published a hit novel or appear in a new movie, we go to great lengths to see and be seen. Avraham and Sarah can move to the edge of the desert, set up their inn (Sotah 10a-b) and be a model for the world. For the rest of us, though, there are times when we need to be a Yom haMeyuchas, learning from others and so developing ourselves. Thank Gd, we are blessed with four wonderful children with very different personalities, and we now manage to have all of them with us in shul Shabbos morning for davening, from the almost-10 year old down to the 3 year old. All of them come with my wife and me before davening , and all of them remain through the end. Every once in a while, people ask me for “the secret” to their good behavior. If we have succeeded at all [and on many mornings I tend to doubt it...], the secret is mostly in my much-admired rebbetzin’s genes as well as influence. Still, we have learned some lessons over the past six years of bringing kids to shul, lessons which also apply to other areas of raising kids. Here are several; please add your own. In terms of bringing kids to multiple davenings on the same Shabbos, in terms of bringing kids to shul early in the morning or late at night, and in terms of the level of davening participation we demand, it’s important that we figure out their shul-tolerance in advance. This is huge; kids must know, in advance, what exactly they are expected to do. This includes providing clear and timely notice before sections of davening in which you cannot speak to them; parents can’t stand up in the amidah or go for an aliyah without forewarning their children and setting them up with proper activities. Instructions must also be repeated at appropriate intervals for younger children. As far as avoiding the wrong distractions, this is the one benefit of my sitting far from others; there is no pressure for them to converse with peers or adults. But we must also provide the right distractions, ways for the kids to spend their time in shul productively, when they are not davening. For some it’s picking out letters in the siddur with them; for others it’s storybooks or sefarim. But just like adults need positive distractions, so do kids. This also goes for the shul's youth programs during davening. Know what the programs are, and know whether they are good for your kids, and in what doses. Children often see davening as a “shul thing” rather than something they do, personally, and they don’t understand why it should have meaning for them. Davening should be a part of their daily lives in some way, both in learning about it and in practicing it, so that they understand the conversation with HaShem as a function of their normal, day-to-day existence. A no-brainer. If you talk, or if you space out, then the kids will do it, too. This may mean delaying your amidah until a problem is resolved, or staggering child-care with a neighbor. It certainly involves interrupting your davening, when at all possible, to converse appropriately with the children, explain the davening to them, and keep them involved. Leaving shul, handing a child off to another parent, whatever, but there must always be a plan. It’s important for parents to understand why their children daven, or do not daven. Do they understand what davening is about? Can they read well? If they are not davening, is it rebellion against you, boredom, distraction by their personal lives, spacing out… ? Training kids to daven is chinuch, a critical parental responsibility, but getting agitated and losing your temper won’t help. If your child isn’t ready, getting upset at him won’t make him ready. Take each child at her own level, with his own style. Oh, and be ready to throw any and all of these rules out the window for your particular child. It’s the age-old lesson of child-rearing: No battle plan survives first contact with the enemy. In books, on stage and in film, the setting of a story is, itself, a character, providing a sense of realism, giving the actors options and limits, and interacting with them. The same is true in the Torah; every backdrop is part of the story, whether Canaanite territory or Egyptian empire or Har Sinai or Mishkan. And with the start of a new chumash this morning we are introduced to another player: Midbar, Wilderness. Of course, we’ve met the midbar before; the Jews already hungered for food and thirsted for water back in Parshat Beshalach, right after they crossed through Yam Suf. But that was a cameo appearance; the midbar was quickly subdued by Mun and Miriam’s well and Aharon’s clouds, and then fully eclipsed by Har Sinai and the Mishkan. Only as the Jews move away from Sinai does the midbar, the wilderness, come to the fore. The midbar offers a lesson in humility; in a wilderness, all beauty is natural, all artifice is overtaken by nature, all property is communal. And a midbar offers a lesson in isolation; the Jews receive the Torah in the desert in order to afford them the opportunity to focus on this Divine gift without need to plant their fields, maintain their homes or engage in commerce. Indeed, in the midbar a large group of women established their homes at the Ohel Moed and devoted their days to Torah study. Third, a midbar is tabula rasa, a blank slate on which our story can be scripted, an open canvas on which we can paint as we choose. In a desert wilderness, a society with neither incumbent wealth nor predetermined heirarchy, Ahaliav from the tribe of Dan can become master craftsman of the mishkan and a nation of slaves can demonstrate spiritual greatness. • Canaanite Israel lacked isolation; the same was true for Egyptian slavery. • The Mishkan was the opposite of humility, a grand construction outfitted with beautiful silver and gold and embroidery. And so, this week, we meet the Midbar environment in which the Jews will work through their growing pains, enduring rebellions and hunger and suspicion while studying the Torah and achieving personal, tribal and national greatness. Some might compare the midbar to childhood - at what other time in our lives have we accomplished so little, at what other time in our lives are we as unentangled from others, at what other time in our lives does the future lie so pliable before us? We are tempted to believe that childhood is the ideal, midbar-like time for a Jew to embrace Torah. But I believe the comparison to childhood is a mistake of great consequence; people who believe they missed their chance in childhood abandon hope of change, instead of taking the opportunities that yet lie before them. It is never too late. Always, we can return to the midbar, if not in practice then in state of mind. • Always, we can develop humility. • Always, we can pare down our distractions. • And, always, we can envision life as a canvas on which to paint afresh and build great things. • They had been idolaters, and they had stood at Sinai witnessing Divine revelation. This was not a child-nation, emerging blinking into the sunlight for this time – but it was capable of nonetheless viewing its future as a blank slate, and creating a brilliant and enduring legacy for its descendants. On the first morning of Shavuot, we precede the Torah reading with the public recitation of Akdamus, an Aramaic poem describing Divine might and introducing the Torah reading itself. Toward the beginning of the poem, we describe Gd creating the universe with the letter ה, a letter which is just a breath, the simplest exhalation, demonstrating that for Gd, creation is simple and the possibilities are infinite. For us as human beings, creation is anything but simple and easy – but when we, like the Jews in the midbar, look at the world as a blank slate and an opportunity for accomplishment, then for us, too, there will be few limits. 1. We are honoring an outstanding volunteer couple this Shabbos, and right before the Akdamus closer I will speak about them as people who view life as a blank slate. They are great people. And they also read this blog. Hi, JP! 2. Eruvin 54a comments on the intentional presentation of the Torah in a wilderness. 3. On creation of the world with a ה to signify Divine power, see Midrash Tehillim 62:1 and Bereishit Rabbah 12:2, but also see a different explanation in Menachot 29b that it’s about the possibility of return and repentance. 4. I actually wanted to make the whole derashah about the two different explanations of the ה-based creation, but had to give up late Friday morning when I just couldn't make it work. I am not terribly pleased with this derashah - I don't think it adds much to people's knowledge or gives new perspective, except the idea of setting as character and the point about the Jews not entering the midbar as a blank slate - but perhaps some other year. I am making no progress on my derashah for Shabbat, and my Avot d'Rabbi Natan class for Shabbat afternoon is proving recalcitrant as well, but I am completely taken by Rabbi Akiva, the topic of the latter class. Pirkei Avot teaches: "Wrestle in the dust of their feet." How? When a talmid chacham enters the city, do not say, ‘I do not need him.’ Rather, go to him. Do not sit with him on a bed, chair or bench, but rather sit before him on the ground, and accept every word that leaves his mouth in intimidation, awe, trembling and shaking, as your ancestors received the Torah from Har Sinai in intimidation, awe, trembling and shaking. Alternatively: ‘Wrestle in the dust of their feet’ refers to Rabbi Eliezer, and ‘Drink their words thirstily’ refers to Rabbi Akiva. Immediately Rabbi Akiva drew a logical inference for himself: If the soft can carve the hard, then how much more so could words of Torah, which are hard as iron, carve my heart of flesh and blood! Immediately Rabbi Akiva sought to study Torah. He and his son went and sat by the schoolteachers, and he said, ‘My master, teach me Torah!’ Rabbi Akiva gripped the top of the board and his son gripped the other end of the board, and the teacher wrote א ב and he learned it, א ת and he learned it, Torat Kohanim and he learned it. He continued to learn until he had learned the entire Torah. He sat before Rabbi Eliezer and Rabbi Yehoshua and said to them, “My masters, begin to teach me the reasons of the mishnah!” When they taught him a law, he went and sat privately and asked, “Why is thisא written? Why is this ב written? Why is this said?” He then went back and asked them and stumped them with words. That is what Rabbi Akiva did to Rabbi Eliezer and Rabbi Yehoshua. Rabbi Tarfon said to him: Akiva! Regarding you it is written (Job 28:11), ‘He binds the streams so that they do not weep; he brings that which is hidden to light.’ That which had been hidden from humanity, Rabbi Akiva has brought to light. Rabbi Akiva will make paupers liable for judgment, for when they are asked, ‘Why did you not learn Torah’ and they reply, ‘Because we were poor,’ they will be told, ‘Rabbi Akiva was exceptionally poor and destitute!’ And when they say, ‘We had children,’ they will be told, ‘Rabbi Akiva had sons and daughters.’ But they will say: It is because of the merit of his wife Rachel. Rabbi Akiva went to study Torah when he was forty years old. After thirteen years he taught Torah publicly. They said: He did not pass away until he had tables of silver and gold, and he ascended to his bed with ladders of gold. His wife had tunics and an ir shel zahav. His students said: Our master, you have embarrassed us with what you have made for her! Rabbi Akiva replied: She endured great pain with me, for Torah. I love the resolution of that image of the chiseler uprooting the mountain; I have known such people, in Torah and elsewhere, and their dedication to a vision and their resilient refusal to bow before adversity is awe-inspiring. But I wonder: What is the rock, and what is the Jordan River? Does the rock represent the sages, and Rabbi Akiva chisels away at their teachings, embracing and then understanding and then challenging their lessons until he can sink them in the river before his own accomplishments? Or is Rabbi Akiva himself the rock, and is his task that of immersing his own stubborn self in the Torah? We stand opposite a great and mighty revelation, the likes of which have not been known in human history. There is no doubt; changes of great value are hidden in the depths of this global revelation. There is also no doubt that the hand of Israel, with its spirit, with the voice of Yaakov, must here be revealed. It would be a disgrace to make a fraud of the deeds and effects, the ambitions and the causes and the overall yearning for life which has transpired in recent years. As much as they are mixed with dross, as much as they have yet to reach their appropriate form and their living design in their life of truth, we still see in them, in the end, fulfillment of the sacred revelation, unmistakeable signs that these matters have been orchestrated by Divine will, and the hand of Gd sets them upon a paved path to His nation, which is exhausted from its great many troubles, and to His world which is sprawled beneath the burden of the confused life which weighs upon it. What would Rav Kook have said, had he lived to see 1967? And what would Rav Kook tell us now, in 2009, with old/new plans afoot to separate Jews from Yerushalayim? Here we go again, back to the death topic. Sorry, but it comes up a lot, just like death itself. I dislike the idea of hosting a funeral in shul, whether in the sanctuary where we daven or in the social hall. (There are halachic grounds to oppose hosting certain funerals in a shul, but that's not the topic of this post.) And yet, we do it, and we will continue to do it. Basically, this is the problem: It converts the space of personal and communal conversation with Gd into a space of personal and communal despair. I don’t want to see that funeral, I don't want to remember crying my way through that eulogy, when I walk into shul next Shabbos. We don’t engage in comedy in a davening area, because we don’t want to convert the shul into a space for joking around and קלות ראש. We don’t hold board meetings in a davening area, because we don’t want convert the shul into a space for conversing about daily matters. And so we really should not hold funerals in a davening area, because afterward, when we will enter the shul, we will remember the grief of that loss. But, on the other hand, there are real reasons to hold a funeral in shul, and Jews have done it for millenia. First, attending a funeral is one of our most sacred mitzvot. It’s a time to honor righteousness, a time to cry for what we have lost, a time to express our belief in surviving death. It expresses our beautiful if, at times, agonizing faith in Gd and eternity. Second, funerals express our commitment to kindness and respect. The Sefer Chasidim writes that we rise before a passing funeral bier not only to honor the deceased, but to honor those who are engaged in this mitzvah of taking care of the deceased. And third, there are reasons to hold specific funerals in a shul. Today, for example, we will bury an 89 year old man who came to minyan every day, morning and evening, until the very last day of his life; how could we not bring him back to the place where he was last conscious, and honor him within the walls of the minyan he upheld? How could we offer דברי הספד (eulogy) in any other building? So, as in many areas of life, we end up doing what we are reluctant to do. We hold the occasional funeral here in the social hall of the shul, and we honor our righteous role models. And, yes, sometimes I stand in conversation at kiddush and my mind flashes back to what I least wish to remember on a Shabbos morning. But I suppose if that’s the price of honoring a נפטר (deceased person) properly, then it’s a price we ought to pay. • On the front page – Not too much, and it should not require scrolling. • Beyond the front page – The community. I have seen shul websites that try to cram the world on to their front page; the result is often intimidating, not to mention un-readable. Eruv information, real estate listings, pictures of the shul and of special events, news from Israel, flyers for upcoming events, contact information for the shul and the sisterhood and the men’s club and and and and and. And then there are other sites that say almost nothing – location, if that, and the names of the leadership. • And, of course, there should be links to the content within. The links should not be intrusive, but they should be obvious and easy to use (ie don’t cram the buttons too close together). All of the above is more or less obvious, I should think. But there is one other piece I like to see, which I usually do not: Material which makes the website a real destination for people, just for the sake of that material itself. We’re talking about items that stand out more than the standard transcribed speeches or audio shiurim. This must be something that will turn up on search engines, that will attract readers who have no interest in your shul. It should be a unique resource with real added value. My first shul, Congregation Ohawe Sholam / Young Israel of Pawtucket, Rhode Island, had a few such areas on our site. It wasn’t a great site. In truth, from an aesthetic perspective, it was rather poor. But we had material that people came to see – a series of essays on Tanach, and, more than that, a Jewish Spirituality email list. Who else had such a list, and in a shul? People searching for “Jewish Spirituality” (and who isn’t?) came across our site, forwarded links, and so its name spread. Unfortunately, the material on that site is now eight years old and will likely not show up on any search engines anymore, but shuls that keep their material up-to-date show they have something to offer, and to interest people in their community. I've been reading a lot of Rav Kook lately, and I love, especially, his poetry. I wouldn't exactly call it accessible reading, but I would definitely call it rewarding reading. Blessed are you upon your arrival to the land of life, exalted guest, our great and beloved poet, Master Chaim Nachman Bialik, may Gd bless you from Zion. With pure and complete love and with elevated respect I honor myself to extend to you, our mighty poet, my hand in blessing as you first step today upon the land of our rejuvenation. Prepare, our beloved poet, to greet the dew of life and the living, rich heavenly generosity, which will begin to display itself to you anew from the portion of Gd, full of life, which is prepared for every rich soul of the house of Jacob which enters the air of the spiritual life of the beloved land. O poetic soul, awake, awake, speak the living song to the living nation, which awakens to greet the source of its life on the ground in which it is planted. Now sing, please, o poet who is so beloved to us, of the salvation of a nation and its Gd. Awaken your harp, be filled with strength and pleasantness, to sing to us the song of the land, the song of the rejuvenation. Inform Jacob: Behold, a nation is born! Behold, the living nation has risen! Behold, he strides across Tavor and Chermon! Sing to us of the strength and might, of the wealth and honor, which are of the Gd of Israel in heaven and earth, in valley and mountain, in Carmel and Sharon, in the portion of His lot. Be happy and joyous, beloved and pleasant poet, in the joy of the hope of our nation and our land. Considerable research has demonstrated that the years spent in a Jewish day school environment play a powerful and essential role in Jewish identity formation and ongoing commitment to observance and Jewish community. Even proposed "Hebrew language" charter schools fail to provide an environment conducive to the development of deep-seated Jewish identity. Further, these schools are mandated to teach limited aspects of Jewish culture, self-consciously avoiding Torah and mitzvot. I have heard from a few people who are upset that this resolution rejects the idea of Hebrew Culture charter schools. They argue that charter schools would be a great option for smaller Jewish communities, which cannot support day schools and high schools. Unfortunately, my sense is that those people don’t actually understand how a charter school functions. As someone who worked hard on trying to create a Hebrew Language charter high school locally, I can tell you that it is not possible for a Jewish community create one - unless that community has enough kids to support a full Jewish day school. There are two reasons for this – one political, one economic. A charter school operates as part of the public school system, and must be approved by the local public school board. Although the charter school is technically under the state’s jurisdiction for certain matters, and although the charter school can appeal school board decisions at the state level, the school must be studied, voted upon, and consistently reviewed by the school board. Understandably, school boards do not take kindly to charter schools – because the charter school takes their money to support the education of a small group of children. (Yes, we already give them our money in taxes, but that's not the way they see it.) School boards require the charter school to define precisely why those children cannot get a proper education in the normal public school system. And when you tell them your difference is in terms of Hebrew language, and even culture, they are unimpressed, to say the least. In our case, the district gladly offered to institute Hebrew language electives in the public school. This one is an even tougher nut to crack; it’s really what renders the charter idea an impossibility. Charter schools cannot charge tuition, by law; they can only receive funding from the district. The district provides them with the same funding per child that it provides each public school – in other words, $6,000 to $9,000 in most districts. This means that the Jewish charter school will receive only that amount. Now imagine you are trying to run your Hebrew charter school in some small community, with ten kids, or fifty kids, or even 100 kids. And let’s say it’s a high-end district, so you make the maximum per student. Still, do you think you can run a complete school for ten kids on $90,000? Or for 100 kids on $900,000? The economies of scale that allow public schools to spend this small amount per child don’t operate until you are up in the 200 kid range – when you really should be able to support a private school. And, of course: You could charge more than that in tuition if you were a private school, and still be giving parents an incredible break on current tuition costs. So that’s the deal: Aside from politics, the charter school idea cannot work economically unless the Jewish community has so many kids that it can support a private school – and it could have far more money than a charter school would have, by going private and charging a relatively minimal tuition. Occasionally, when I have the chance to read my children a bedtime story, I instead tell them a story from my own rabbinate. I remove all identifying details, of course, and try to remove the nightmare-inducing aspects of rabbinic life, but what remains is often a simple tale with a good moral, about right for the ages of some of my children. Once upon a time there was a rabbi. This rabbi loved to teach Torah; he spent a lot of time learning and preparing, and then he taught the people who came to learn Torah. Sometimes they learned Chumash, sometimes they learned about Shabbat or Yom Tov, sometimes they learned about Jewish beliefs, and sometimes they learned Gemara or Jewish law or Jewish history or Hebrew. Some people who came to learn knew a lot, and others knew a little, but they all came together to learn. The students all had a good time together, too. But the rabbi had a problem: He spent so much time talking and talking in these classes, and he had such a good time, that sometimes he got carried away and wasn’t careful with the things he said. Sometimes he meant to say one thing, but something else came out, and he was misunderstood. And sometimes he even slipped and said things that upset one of the students. One day, the rabbi was teaching a class about sharing, and not being greedy. Before starting the class, he mentioned that it was too bad Shlomit, a certain student who came to a lot of classes, wasn’t there. Then he started to teach about being greedy. After the class was over, someone told the rabbi that it sounded like he was saying Shlomit was greedy. The rabbi was very upset; he had not meant that at all! What if people would think that Shlomit was greedy? Or what if people would think he was nasty for having said that? So the rabbi immediately wrote down a list of all of the people who had been in class. He emailed all of them, and then called all of them as well, to make sure they would understand that this was not what he had meant. And he called Shlomit, too, to apologize. Everyone said that they knew what he had really meant, and Shlomit forgave him, and they lived happily ever after. I was the Resolutions Chair for last week's RCA Convention. I am not ordinarily a fan of resolutions; as I told the person who solicited me for the job, I am not sure that resolutions actually accomplish anything. But I was blessed with a good committee, and we produced documents which I feel convey a Torah outlook on topical issues. The documents aren't particularly controversial, mostly expressing common sense, but that's fine with me; I don't feel any particular responsibility to generate controversy. I am proud of the fact that the documents are not simply We believe X or The community must do X. Rather, they are expressions of a thought-out philosophy, which leads to specific practical conclusions. Even in ripest times, the Jew is commanded by Torah and tradition to "Walk modestly with G-d," eschewing ostentation. The Jewish citizen is further required to measure the arc of his financial steps with responsible care. Tzedakah, too, is a fundamental Jewish imperative, conveyed in both lore and law; our righteous ancestors defined their well-being not by the number of possessions they acquired, but by the number of mouths they fed. Today, in the midst of an international economic crisis, our tradition demands that we re-commit ourselves to these values of modesty, responsibility and tzedakah. Modesty, because the Talmud teaches that we may not enjoy luxury when others suffer, let alone when we, ourselves, are suffering. Responsibility, because the bite of personal debt inflicts pain upon the entire community. Tzedakah, because since the days of Devarim we have been instructed to employ our wealth as a weapon against the poverty of others. Were the financial crisis to end tomorrow, our community would, nonetheless, be required to live modest, responsible and generous lives; we can do no different when surrounded by unemployment and economic despair. We call upon every Jew to opt for modest choices and lower costs, to guard against deficit spending, and to direct some of the consequent savings toward assistance for others. And we ask those who can afford more to purchase less, in pursuit of modesty and responsibility and in recognition of the social pressure that their luxury brings to bear upon others. May Zion soon be redeemed with justice, and may her children return to her with righteousness. Our Jewish Federation generously supports our local vaad hakashrut (kosher supervision agency), the Lehigh Valley Kashrut Commission, or LVKC. Tonight I presented our annual funding request before the Federation's Allocations Committee, and preparing that request reminded me of why local kashrut certifiers and local kosher bakeries are important. • Kosher-observant Jews visiting relatives can find food. Without that bakery, all of the above becomes harder. Further, the community cannot grow, because outsiders perceive it to be a backwater. • A local vaad holds kashrut awareness programs for people who would never go to oukosher.org or star-k.org. There’s more, too, but that’s what came to mind tonight as I prepared our report for the Federation. The challenge is that as the major kashrut certifiers – OU, Star-K, Chof-K etc – expand, the local kashrut certifier faces the loss of key businesses. National organizations take over major facilities, the ones which can provide the greatest income for the least actual supervision. Whether these businesses pay so much as a gesture of corporate responsibility to the community, or whether it’s just because they’re used to large numbers, those businesses often supply income which helps subsidize supervision for smaller, cash-poorer businesses. We can certify a small operation at zero margin, and we can subsidize supervision of community non-profits, because of a large bottling company that gives us more dollars than we need to pay our supervisor. The national and international organizations are important. The local orgs even depend on them, because all of the ingredients coming into our local facilities are produced under those broader certifications. But let’s not forget the work done by the locals, and the way that they, and their supermarket bakeries, keep small Jewish communities going. Here's to me - and to you, Jack! Years ago - at least seven - a Shabbat guest gave us a bottle of champagne. At the time I was wrestling with a thorny communal issue, and my honored Rebbetzin and I decided that we would pop the bottle when that issue was resolved. The issue was indeed resolved, but not cleanly; related problems developed, and so we waited on the champagne. Then those matters came to a close, but other entanglements made us feel it wasn't time yet. The bottle came out of the fridge, and sat in a corner. Eventually it moved to a cabinet. New milestones neared, and the champagne returned to the refrigerator, but then crisis resolutions fell short of their promise and the champagne was again sidelined. Toilet training. New contract. Conflict mediation. A cure for a friend. And so on. But I’ve changed my mind; I think it's time to drink the champagne. We have not reached some great moment; numerous obstacles remain before our current move will be complete, and even when those are surmounted we will only be at the beginning of another long climb. But I think we’ve been going about the champagne all wrong. Sure, celebrating success is great, but that’s not when I need a high or an incentive. Success really is its own reward. I need the celebration, the positive feeling – whether from bubbly drinks or grape juice or a hot fudge sundae or whatever – when I’ve invested hard work and have not yet seen the results I want. Pirkei Avot says, “If someone tells you he has worked hard without finding success, don’t believe him.” True enough – but only in the long term. The results don’t necessarily show up in the short term, and I need the reinforcement while I wait. Some aspects of the Torah encourage us to be goal-oriented, and thereby push us to hold all celebration until we have achieved complete success. There is no full-throated laughter and joy while we lack a Beit haMikdash. An animal with a slight blemish is disqualified from use as a korban, a tefillah with slightly inadequate kavvanah (mental focus) is defective, an etrog with black spots is inferior to an etrog of perfect color, a good seder (period of learning) is one in which there is no bitul zman (wasting of time). The goal is 100% - so how can I celebrate when I am still far short? And Zecharyah offered one solution: Stop seeing yourselves as terminally small; you are Bnei Yisrael, and you will have a Beis haMikdash, and a Kohen Gadol, and all of their associated splendor. Just visualize it. The solution to being בז ליום קטנות, the way to stop degrading the day of small things, is to break away from the everyday and think BIG, to think of BIG ideas and to develop BIG dreams. With this post I add a second solution: Take a momentary break, drink the champagne, and celebrate the efforts which have brought you here. So even though we have a ways to go, I think it’s time, one of these days, to break out the bottle. And while we’re at it, we’ll drink to Birthday Boy Jack, who may not have achieved all of his goals yet either, but who certainly deserves a l’chaim along the way. Pesach Sheni, smothered in this month of Ziv by Yom haZikaron, Yom haAtzmaut, Lag ba’Omer and Yom Yerushalayim, attracts very little attention. The story of Pesach Sheni begins in Bamidbar 9, at the start of the Jews’s second year in the desert, when some of them cannot bring the korban pesach because they are tamei (ritually unacceptable) due to contact with corpses. These people don’t want to miss out on bringing the korban pesach, and Gd informs Moshe that they will not be cheated of the opportunity; they will only need to wait a month, and bring the korban on the 14th of Iyyar. The gemara provides various details of this celebration – who was qualified, what if one skipped it, etc. But one interesting note comes in the Haggadah, with stealth mention of Pesach Sheni. First, there are halachic differences between pesukim in terms of how we view the mitzvah of eating matzah and marror [as part of the korban pesach mitzvah or not]. And second, why would the Haggadah bring a sentence from Pesach Sheni at all, even if there were no significant difference? One popular answer is that by reciting this passage in the Haggadah, we express the hope that even if we cannot eat the korban pesach on Pesach itself, the beit hamikdash may be rebuilt by Pesach Sheni, and we may be able to eat the korban pesach on that date. There are reasons to challenge this answer, but I think of it anyway every year, for bitter and sweet aspects, on Pesach Sheni. Bitter: Gd-willing, I will momentarily go home for lunch and eat matzah, and I’ll dig up some horseradish from the garden. (It’s only fair to use horseradish on pesach sheni, since I use romaine at the seder for marror.) And, once again, I’ll remember that the opportunity has been missed for another year. Sweet: But this is still a holiday, also-ran or not. It’s still a chance to remember a day when hundreds, perhaps thousands, were given another opportunity to celebrate Pesach. It’s good to remember – as we read the Haggadah, and then again a month later today – that often, even when we lose one opportunity, Gd gives second chances. I don’t use profanity; the gemara is very clear about how repellent it is when a person cannot control his tongue, and uses his gift of speech for base purpose. Presumably, the same applies to the keyboard. So I won’t say what’s on my mind. And there’s nothing meaingful to say, anyway. What would you say? What do you to someone who carries a baby to term, only to discover upon birth that it is not viable? What do you say when you stand there in the NICU and look at a baby, born yesterday, that will not see tomorrow’s sunrise? What do you say afterward, as the body lies, still, on a table designed for serving up life and joy and celebration? Forget what you say to the family, to the mother. There is nothing to say; you’re just there. But what do you say to yourself in order to shut out the image, so that when you look at your own happy children you don’t see those closed eyes, the miniature fist that should be clenched, not lax? What do you say to calm your mind, so that when you look in the mirror you are not awash with guilt for having been spared this calamity? What do you say to relax your nerves so that every pregnant woman doesn’t suddenly seem to be a disaster in the making, so that when you finally drift off tonight – eyes closed like the baby, don’t you know - you won’t see visions of what you saw today? And what do you say to others, to people you meet who waste their breath and time and happy moments on turf wars and pride and who-did-what-to-whom? Or to people who have done nothing wrong, beyond being concerned with a passing, comparatively trivial matter at time when you are enveloped in this? I know pediatricians, hospitalists, NICU personnel; they see this more than I do. I want to ask them, but I don’t want to know the answer. I know many, too many people who have endured this personally and managed to live life, sometimes birthing more children, sometimes adopting, sometimes not, but finding a way to survive. I don’t want to know that you can’t learn to live with it. But I certainly don’t want to know that you can learn to live with it. While, however, this training for earning a living is unquestionably a father's duty, beware of seeing in it the whole of that duty and of thinking that you have done enough if your child is able to keep body and soul together by his own efforts, or even to set up house. Of what use are a living and a home to him if his spirit is unilluminated, if he knows how to make a living but not to live as a Jew? This is obvious, of course, but I have seen so many people who don't grasp its truth and convert that truth into reality. Kids need a richness of life, a spiritual depth, a full and mature religious education, an appreciation for the beauty of their world and the love of their family. I don't want this to turn into a rant, even though it is tailor-made for a serious tirade. I spent the morning with a family suffering an unbelievably horrific loss, and after what they are enduring, everything else in the world, even matters of the greatest spiritual importance, just pale to utter nothingness. My heart hurts. I lack the interest in ranting. So I'm going to leave this where it is, and let you do the commenting. This is a personal complaint post; feel free to skip it. I would, if I were you. 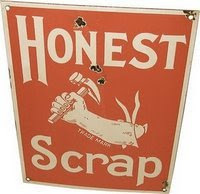 But A Living Nadneyda was kind enough to tag me for the Honest Scraps Award, and now I'm supposed to write ten honest things about myself, and the only one I have time/energy to discuss at the moment is a complaint, so there it is. I apologize. I have discovered, to my chagrin, that I am not much of a traveller. • I can work on a laptop or with a sefer, and keep in touch by cell phone as well. And the mishnah/gemara make it sound like all of the tannaim were good travellers: Rabban Gamliel and his cohorts appear on boats headed to or from Rome, or take long walks past Har haBayis or along the water, etc. Caravans and ships fill the gemara, with all sorts of halachos from Shabbos issues to responsibility for property to davening to terumah/maaser. On the other hand, Rabbi Akiva does place a premium (toward the end of Pesachim, in advice to his son) on studying in an undisturbed area. And the gemara does talk about not davening for days after coming off the road, because your concentration is so disruptive. • I get frustrated about missing chavrutot and shiurim. • The airline industry is absurdly irresponsible. • I can’t stand the repetitious commercials blasting away on airport television sets. I don't know what Evyawning is, but I heard way too many commercials for it during last night's flight delay in Toronto. • I’m too cheap frugal to spring for airport candy bars. And the cooler souvenir foods they stock are never kosher. • I don’t sleep well in foreign beds. • My emails pile up, because my laptop doesn’t always cooperate. • I can’t write up shiur source sheets, without my library available to get direct quotes (no CD ROM drive on the laptop, either). • In international travel, I can’t use my cell phone. • I don’t actually get time to see new things; I spend most of my time in airports, because I don’t have the luxury of taking long trips. I owe you 9 other honest scraps. And seven bloggers to tag with this award. Some other time, I hope. I know rabbis who complain about chatter in shul and comment that Christians know how to conduct themselves in church. They say, “Imagine if someone who was not Jewish would come to shul – wouldn’t you be embarrassed?” A popular theory explains the allegedly contrasting experiences, arguing that Jews feel a greater sense of at-homeness in shul because they are (theoretically) present for twice-daily davening, where churchgoers are only present on a weekly basis. The argument in favor of tweeting promotes this as a way of building community during worship, as well as a way of showing that the church is in sync with the modern world. I hear these arguments, but it's not for me. Obviously, it wouldn't be acceptable on Shabbat, but even during the week I wouldn't go for it, not during davening and not during the speech. We do promote minyan and communal worship in shul, but still, our worship is supposed to be private, personal. During Psukei d’Zimra, we all say the same things, but we say them individually. [Note: This is not universally true, and wasn’t always the way it was done, but it is the way Ashkenazim have done it for centuries.] This is also one reason for our emphasis on having a silent Amidah. One congregant of mine labelled it “parallel play,” a la the style of very young children who will play in the same room, with the same toys, but act as though they are alone in the world. I think she was right – that’s what we do. We want everyone to do it together, but we still do it personally. So having people communicate with each, even positively and even focussed on prayer, seems to me to defeat the purpose of our silence. Silence is also an expression of spiritual depth… Consider Aharon’s silence at the death of Nadav and Avihu, and the praise heaped upon him for his articulate inexpression. Consider Chanah’s silent plea for a child… a servant of Gd, nobly stoic in her suffering. And, finally but most significantly, consider the contrast between Eliyahu’s thundering rage and the Divine קול דממה דקה with which Gd rebukes him, a sound so thin as to be nearly inaudible, and yet deep enough to contain the majesty of the Creator of All. This is a silence of presence, of pent-up power, of tzimtzum, of a Being who surely can thunder like Eliyahu but who chooses the containment of Chanah. To me, the silence of Shemoneh Esreih is an attempt to capture this noble state of expressive restraint. Some time back I had a Shabbat guest in shul who conversed with his seatmate whenever I rose to speak. It was incredibly distracting for me, to the point that I actually went over to him privately and asked him to stop. I hated to do it – both in terms of embarrassing him, and in terms of looking like I was concerned for my own honor. But it wasn’t about my own honor; it was about the fact that when I am addressing a room, even a big room with 150 people in it, I get distracted if I someone in my sightline is conversing, and once I am distracted I can’t speak intelligently. I get completely thrown off. I imagine Twittering would have the same effect on my concentration. So no Twittering during services, thanks. Let the churches have fun with it instead. A tale of five Jews. One says Hallel on Yom haAtzmaut (Israel's Independence Day) because he believes that in 1948 Gd miraculously created a country that has saved thousands of lives and enabled a massive growth in Torah learning and observance over the past sixty years. Another does not say Hallel on Yom haAtzmaut because he doesn't believe Gd orchestrated anything. A third does not say Hallel on Yom haAtzmaut because Israel has a secular government. A fourth does not say Hallel on Yom haAtzmaut because he believes that Jews are not supposed to return to Israel without Mashiach. And a fifth does not say Hallel on Yom haAtzmaut because the Israeli government evicts Jews from their homes and is willing to trade land for questionable peace agreements. Certainly, Hallel is appropriate when Gd engineers a visible miracle. The gemara says, “The prophets enacted Hallel for the Jewish people, to be recited for every occasion and every danger that should never befall them. When they are saved, they say it regarding their redemption.” This gemara teaches that as we recite Hallel at the Seder, so we should recite Hallel whenever HaShem saves us with a miracle. But there is debate about how to identify a miracle – so how does a shul decide what to do? How does a shul establish appropriate practice, when there are so many different perspectives? Rav Avraham Yitzchak haKohen Kook was a leading rabbi in Israel in the beginning of the 20th century; he was a uniting force for religious and secular Jews, a major halachic authority, a major hashkafic authority, a man with the brain of a talmid chacham, the long beard and black coat of an Eastern European rebbe, and the heart of a Jew who could embrace everyone with sincere love. Rav Kook was a giant of religious Zionism, and in 1924 he formed a yeshiva around that philosophy; it's called Mercaz haRav, Rav Kook's Center, to this day. Rav Kook believed and taught that the modern return to Israel would herald the arrival of Mashiach. Rav Kook saw signs in Herzl’s movement, in World War I, and in the Balfour Declaration, that the State would come soon, but he died too soon to see it, in 1935. Rav Kook’s son was Rav Zvi Yehuda Kook, and Rav Zvi Yehuda took over where his father left off and headed the yeshiva his father had founded. In 1967 Rav Zvi Yehudah was asked why his father's yeshiva, the epicenter of Religious Zionism, recited Hallel on Yom haAtzmaut but did not say a berachah on it. Doesn't the lack of a berachah betray a weakness in their Zionism? And Rav Kook replied with a beautiful answer, the meaning of which transcends the question of what a shul does onYom haAtzmaut and educates us regarding the fundamental responsiblities of a Jewish institution, on any day of the year. Rav Zvi Yehuda explained that someone who does not feel full joy at the creation of Israel should say Hallel without a berachah. He pointed out that the Chief Rabbinate of Israel actually instituted Hallel without a berachah, because their bailiwick includes people who do not feel that full joy. Rav Kook argued that a yeshiva is not the personal property of its founders, or its teachers, or its students, or its supporters; a yeshiva is the global property of any Jew who might daven there, of any Jew who might learn there, and its practices must make it open to all. I believe the roots of Rav Zvi Yehudah’s view may be found in a gemara regarding selling a shul. The gemara says, “A community council may only sell the shul of a small village, but not the shul of a city. Since people come there from all over, they may not sell it; it is the property of the public.” Even the residents, the duespayers, the board, cannot do it. A shul is not the personal playground of its rabbi or its members. A shul is property of all who use it, and all who might use it, and so the people entrusted with its care are responsible to maintain the institution in a way that will make every one of those potential participants comfortable. This liberality has its limits, of course. One limit is halachah; another is practicality. A shul, like an individual, needs to make certain decisions about nusach, for example. But there is still plenty of room for an institution to attune itself to the needs of a larger entity – and the Torah expects us to rise to the occasion, with an openness of mind and a breadth of spirit. With our population here in Allentown, even before we include our highway-travelling drop-ins, we face real challenges in making ourselves open to all. This morning we read the Torah’s prohibition against Kilayim, against mixing plant species. The Torah also prohibits interbreeding animal species. Rav Dovid Kviat explained these prohibitions by arguing that each species is created with its own unique characteristics; to mix species would be to obliterate that which is unique about each one. In our modern society as well, on a human level, we are anti-kilayim; we believe in honoring that which is unique about each individual. So this be the vision of our institutions. Let us recite Hallel in a way that invites in the greatest possible population. Let us live up to the ideal of Rav Zvi Yehuda Kook, building a shul in which everyone can feel truly welcome. 1. Obviously, there is much more to say about how a shul makes its decisions regarding openness, and regarding which areas allow for, and require, openness. But this is a derashah, not a shiur. 2. The gemara on Hallel is Pesachim 117a. The gemara on selling a shul is Megilah 26a. Earlier this week I posted a more complete text of Rav Kook's quote here; it's from a sefer named "Goel Yisrael," produced by Yeshiva Hesder Ramat Gan several years ago.